Create With Me: Waltzingmouse Stamps Blog Party - Sweet Things! Claire has switched it up a bit (you can see info on this post here.) changing the name and hosting it from The Waltzingmouse Blog where you can find all the details and link up your creation! This months' theme is Sweet Things - and here is my first creation - pretty Sa-weet, huh?!?! First I stamped red and white panels with the hearts background stamp from Nordic Winter. Then I cut the panels with a pinwheel die. I put them together alternating colors, red/white/red/white etc. 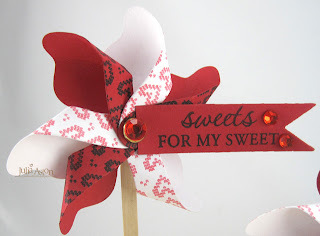 I stamped the Sweets for My Sweet sentiment from Sweet Hearts and cut it with a pennant banner attaching it to the pinwheel by tucking it just under the brad. I adhered it to the stick (a stirrer from Starbucks!) with a thick glue dot, then added rhinestones to the head of the brad and on the banners for a little sparkle! I made the cupcakes with a cherry cake mix and cream cheese frosting from Pillsbury (yummy, yum, yum! and so easy! I'm definitely not a 'from scratch' baker most of the time!) The cute dotted cupcake papers are from AC Moore. You can just change the colors of the pinwheel papers and the sentiment on the banner to celebrate another holiday or special occasion! My second Sweet Thing is a Valentine card I created using sentiments from Sweet Hearts. I love the pink white and grey color combination on this - don't you? I also used a new toy on my card - the cupid and one of the hearts is a Tim Holtz Movers and Shakers Die. I sponged all the edges of the cut outs with Antique Linen and popped them up on foam tape.The patterned paper is from Echo Park Yours Truly 6x6 pad. Accessories: pinwheel die from Lilinker, stirrer from Starbucks, thick glue dot. 3/4" brass fastener - Stamples, rhinestones - Michaels, pennant banner - Spellbinders, cupcakes. Gorgeous projects Julia, I love the grey and link combo too, and the damask paper is so elegant as the backdrop for the sweet Cupid! Love the pinwheels too, wonderful inspiration! Ohhhh LOVE those pinwheels with the Nordic stamping, Julia! So creative, and well....SWEET! Your cupid card is delightful with the layered hearts and pretty papers. Awesome party projects :)! Oh how sweet Julia! 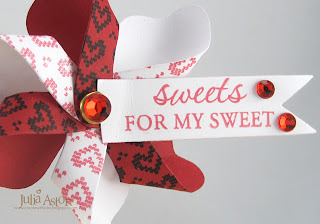 Love the little pin wheels stamped with Nordic hearts and that card is beautiful! OOOOOHHHH Cup Cakes!! They look so yummy with the pretty pinwheels on top! Very Clever Julia! I love your cupid card as well! Cupid always makes me smile! So pretty! Your Cupid card is so adorable as well. Lovely colors. What cute pinwheel "flowers"! And I absolutely love the pink/white/grey combo! Hi Julia! Your projects are amazing! Love the Nordic Winter pattern on your pin wheels. 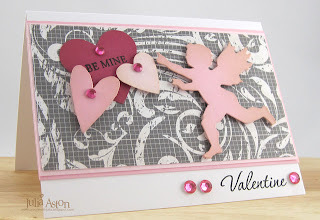 Your sweet Cupid & hearts card is gorgeous. Love the colour combo & papers used. Great job!! The pinwheels are SO adorable--the Nordic Winter hearts are a perfect choice! Love your cupid card with the great colors and sweet images! OH Julie, love love love the pinwhells what a great idea and your card is fab! Love the idea of stamping the pattern for the pinwheels.. so fun! Really sweet card too... thanks for the inspiration! These are absolutely AMAZING. I LOVE the paper you created with the nordic hearts - so beautiful! And the pinwheel are so PERFECT for the sweet theme!! These are both so sweet! Especially the pinwheels! The cupcakes look so yummy too! Great cards Julia! Love them both - and the cupcakes! Great to see Nordic Winter in use for other things, must dig my set back out! Yum!!! The cupcakes looks so delicious and I'm sure they tasted good too. Love the windmill decorations and the Valentine card is so elegant! Lovely projects! Wow, lots of sweetness on this post Julia! Those pinwheel cupcake toppers are so cute with the Nordic Winter stamped on them and your card and beautiful little cupid is such a pretty creation for Valentines Day. Love your pinwheels!! they're fabulous!! and your cupid card is wonderful too! Wonderfully sweet pinwheels and card, Julia. I like the idea of creating pinwheels for different occasions, too. Oh my goodness, those little heart pinwheels are just darling (and the cupcakes look pretty yummy, too)! 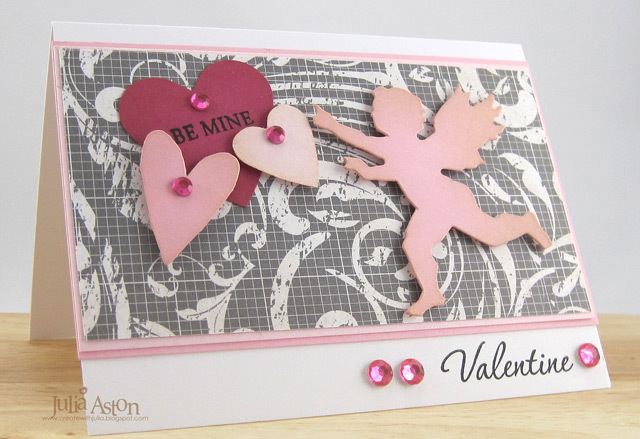 Your Cupid card is lovely - I adore the pink and gray. Super sweet! Both projects. 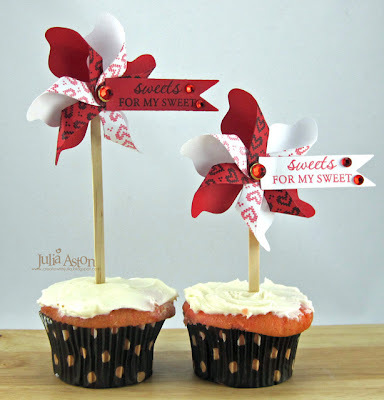 Love how you made the pinwheels and used them as cupcake toppers. I adore your pinwheels on your cupcakes! They are so cute, I can't wait to try it myself! Your card is beautiful as well! Yumness Julia, I love those pinwheels!! fantastic idea!! and your card is brill!! Thank you so much for joining our blog party!! Julia, these are indeed SWEET projects--love those adorable pinwheels and the pretty pink and grey combo on the card. Thanks for inspiration. Like the use of the pinwheels on those yummy cupcakes. Pretty cupid card-tfs. This is so beautiful Julia. Hey Julia! I just shared your pinwheel cupcakes and link to this post on our Facebook page for Lil' Inker Designs! I'm so glad you're enjoying your die and emailed me with this amazing project!! !